Yes, social media applies to B2B. In fact, social media can be MORE transformative for a B2B company than a B2C company. This is because B2B has a smaller potential customer base, a higher average price point, and a customer decision funnel that is more influenced by word of mouth and reputation. Turning your customers into advocates and marketers on behalf of your brand pays off a lot more when you’re selling $10,000 pieces of manufacturing equipment, than it does when you’re selling $3 cans of Pringles. Are there differences between B2B and B2C social media campaigns? Of course. But those differences are at the tactics layer, not the strategy layer. Creating and calibrating a social media strategy for any company should follow the same process. You need to determine why your company should be social, for whom your efforts are intended and where your audience is in the buying cycle, and how you’ll measure success. None of that is impacted in the slightest by whether you’re selling to consumers or other businesses. I’ve asserted that B2B social media tactics vary from B2C, in that they are typically rooted in consumer education and thought leadership, and thus require deeper layers of interaction. Private brand communities vs. Facebook. Linkedin Groups vs. Twitter. Podcasts vs. YouTube. 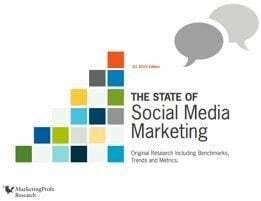 Their State of Social Media Marketing report – a comprehensive survey of more than 5,000 marketers – is filled with more than 225 charts and graphs about all things social media. I believe it to be the most complete picture yet painted of how marketers are thinking about and deploying social media. (Report is $359 if you’re a MarketingProfs member, and if you’re a data hound you can roll around in it for days). According to this report, even with regard to social media execution, B2B and B2C are much more aligned than conventional wisdom suggests. 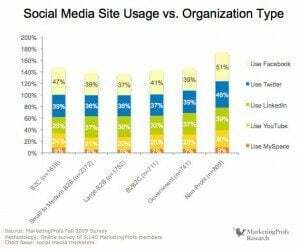 This chart shows usage of five major social outposts by organization type. The statistical similarity shocks me. The range of Facebook usage is just 37% – 51%. Twitter is even narrower at 36% – 46%. The pattern holds for YouTube and Linkedin, too. What this means is that in reality, B2C and B2B social media marketers are largely using the same social tactics. The differences may then lie in use cases and expectations. The variation may come in how social media is used, not which social media are used. I’m also often asked about how B2B social media execution differs between large and small companies. The difference is actually very small, as the goal of social media is to make big companies act like small ones. The MarketingProfs research bears this out, as usage of primary social outposts is almost identical, regardless of budget. 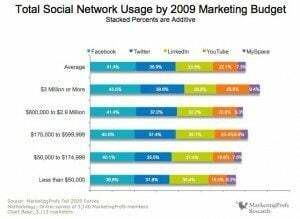 Whether you’re spending millions per year on marketing, or less than $50,000, your proclivity toward being active on Facebook, Twitter, Linkedin and YouTube is strikingly similar. I draw two conclusions from this data. First, marketers of all stripes seem to have accepted (for now) that social media in large measure = Facebook, Twitter, Linkedin, YouTube and blogs. This is a bit disheartening and dangerous, as social media is and can be a lot more than just your company’s presence on these sites. It’s this focus on “media” rather than “social” that could doom this industry eventually. Second, can we please stop all this silly haranguing about B2B vs. B2C in social media? Strategically it’s the same, and at least for now it appears that tactical similarities are also universal.